GOOGLE has joined the race to develop the world's first driverless car,claiming its fleet of computer-controlled vehicles has already covered more than 200,000 kilometres. News of Google's testing of a driverless, or autonomous, car comes just weeks after the company's chief executive officer, Eric Schmidt, said he believed allowing humans to drive cars was a mistake. "Your car should drive itself," Mr Schmidt said. "It just makes sense. It's a bug that cars were invented before computers." Volkswagon believes the cost of the next generation of autonomous cars could make it viable for production. 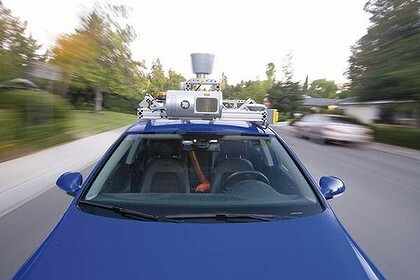 Google claims that taking control out of human hands will help cut the road toll and make travel more efficient. The company is not alone in developing an autonomous car; Volkswagen and General Motors are years ahead with their own prototype vehicles. Autonomous car research was given a big boost in 2005, when the US Department of Defence created the DARPA Challenge, a competition pitting autonomous cars against a desert course with a $US1 million prize. Volkswagen has since invested millions in a dedicated research lab at Stanford University, California, and believes autonomous production cars are only a matter of time. "We don't want to take the drivers out, we want to give them the opportunity to choose, for their time and convenience," said Marcial Hernandez, a member of the Volkswagen-Stanford team. "We're looking at applications like you're going to San Francisco and you get out the front of the restaurant and tell the car to go and park itself; you don't have to look for parking..
"Or applications like you're taking your kids to [Lake] Tahoe and you want to spend time playing board games with them as you're driving up there." Advances in the electronic systems used in modern cars meant no external controls were needed to operate the autonomous car, Mr Hernandez said. The latest driverless Volkswagen and Audi used existing controls, such as the adaptive cruise control, which activates the throttle and brakes. He said the cost of developing the systems has been falling significantly, and the cost of the next generation could make it viable for production. But not everyone will want hand over control of their cars. A Nissan Europe executive, Jerry Hardcastle, recently said he did not believe Nissan would offer an autonomous car. "Removing control completely from the driver is not something the driver wants," he said. "If you want complete removal of control then you might as well get a bus or a train."